Port of Long Beach and Long Beach City College leaders officially launched an new program this week to provide opportunities to local students seeking the employment skills they need to join the goods movement workforce. 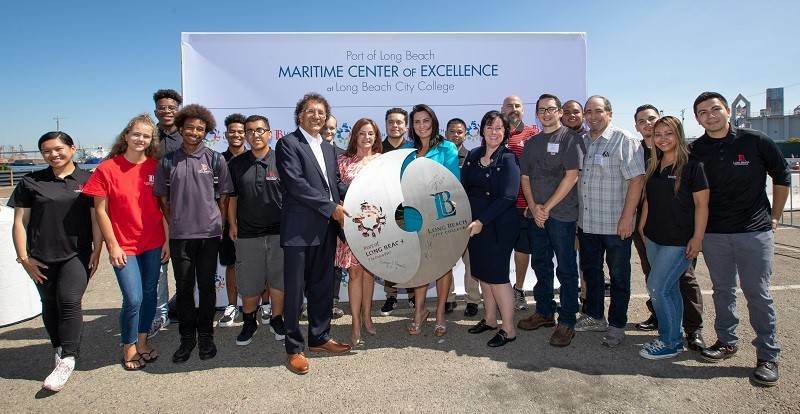 The Port of Long Beach Maritime Center of Excellence at Long Beach City College will target a variety of programs for occupations in the global logistics and supply chain industries that require more education than a high school diploma, but less than a four-year college degree. The Long Beach Board of Harbor Commissioners recently approved $60,000 in funding for the program’s first year as a pilot project. The Maritime Center joins the Academy of Global Logistics at Cabrillo High School as a keystone of the Port’s education outreach efforts. The training at the Maritime Center of Excellence will focus on in-demand occupations which may include jobs like: warehouse and distribution supervisor, transportation supervisor, logistics and supply chain specialist, order processor, shipping and receiving clerk, and scheduler and operations coordinator. As part of the one-year pilot program, LBCC will convene an advisory group with industry partners in 2018 to identify in-demand middle-skills jobs. The goal is to develop non-academic training to meet the needs of local employers, and prepare community members for careers in logistics and supply chain management.